Come see what happens when Nationally touring Comedians hit the road in April! 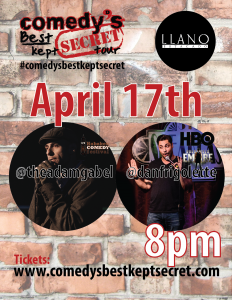 Dan Frigolette @danfrigolette (Boardwalk Empire, Totally Biased, Artie Lange Show) Adam Gabel (Hoboken Comedy Festival) plus a few special guests in each city are Comedy’s Best Kept Secret Tour — amazingly talented comedians who haven’t made it into the limelight…yet. Proven comedians nationally and throughout the New York and Los Angeles comedy circuits, and now going coast to coast to keep Comedy’s Best Kept Secret.